A number of people have asked me where fighting spirit ends and good manners, or concern for the welfare of your fellow kenshi begins. It is equally permissible to move your opponent by striking with your body, but only in the form of correct tai-atari where the contact should be tsuka on tsuka with the hands at waist height and the power coming from the lower body. Pushing to the chin or face, using your feet to sweep or trip, trapping your opponent’s shinai or using your own to push any part of his body constitutes an infringement. Taiatari should be one quick body check followed by an attack rather than a long concerted pushing match. Tsuki is a valuable kendo technique but must be done correctly as a sharp on-off attack. Mukaetsuki, with your arms locked as your opponent makes a forward movement against you is considered the height of bad manners. Even a good attacking tsuki against a teacher or senior in poor taste, if it is done when they make an opening for you to hit men. 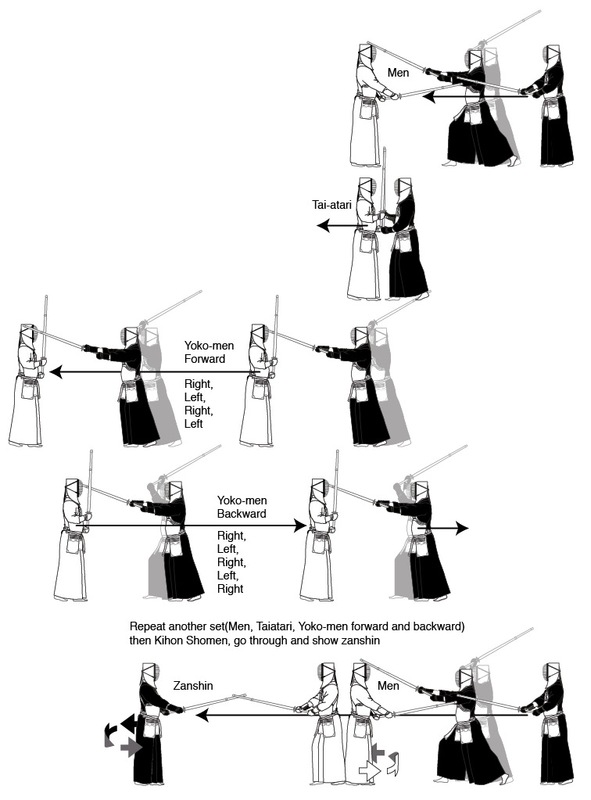 Most of these are obvious violations of the rulesa of kendo and would be penalised in shiai. There are other less obvious breaches of etiquette that are undesirable in keiko. Using your shinai to block without countering is wrong and spoils the flow of the tachiai, as does starting and stopping an attack mid flow to prevent your opponent from hitting you. Hitting your partner off-target in order to create an opening is equally bad, as is showing contempt by celebrating or walking away after striking. Some of the rules invariably get bent in shiai, but there are 3 referees in the court to stop you from transgressing too much. In keiko it is up to you to train as hard as you can whilst still showing respect for your dojo mates. 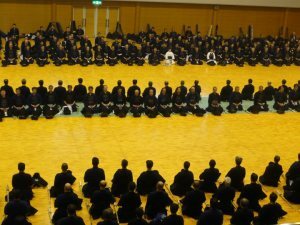 At the asageiko sessions at every Kyoto Taikai the 8th dan motodachi are colour coded. Each wears a coloured band around his zekken denoting hanshi , kyoshi or handle with care. The latter refers to the older sensei, who whilst still able to reduce the average seventh dan to tears, have reached a stage where the body does not repair itself as quickly from hard physical knocks. Although nowhere near the level of these living legends and hopefully with a few years to go before I shy away from physical contact, I am increasingly aware that a push to the face now means two or three visits to the chiropractor. Younger people whom I practise with usually fall into two groups; those who are committed to finishing their technique and those who are wary of hurting the old codger in front of them. Luckily most are in the first category and regardless of who they are up against, will take the centre and go forward in a straight line. The few who are nervous about colliding with their opponent make the mistake of launching themselves of at a tangent after hitting the target. This unfortunately has the effect of spoiling both hasuji and zanshin and invalidating the technique. When we launch an attack against a motodachi , regardless of age, we should follow the principle of attacking with total commitment and full spirit. In 99 percent of these situations your opponent will be able to move to the side and allow you to go through and execute correct zanshin. In most cases moving to the side or diagonal is an automatic response following a successful strike. If he or she does not move, then the answer is obvious – taiatari. As we all know, taiatari is not a push from the shoulders and arms, but uses your abdomen and back muscles to close with your opponent so that you are in a safe “tsubazeriai” distance and no counter attack is possible. To do this effectively you simply drop your hands and push down with your hips as you complete your strike. The objective of taiatari is sometimes oshidashi , the act of pushing your opponent out of the shiaijo, but this is definitely not always the case. You can make “soft” taiatari and then use the safe distance to either cover your opponent’s shinai as you move back to issoku-ito-ma. Alternatively you can use the chance to launch a hiki waza. So don’t worry too much about the old boy in front of you, he can probably take care of himself. We practised butsukarigeiko on Thursday. If you are not familiar with bustsukarigeiko, it is the continued practice of men and taiatari followed by hiki waza. It’s rather like kakarigeiko but with alternate forward and backward strikes separated by body checks. We don’t do it very often because classes are normally made up of kenshi of a variety of sizes, ages, experience and fitness levels, which can make this form of training slightly hazardous. On Thursday however we had a group of young to middle aged males all in apparently good health, so we gave it a try. We started by working on our taiatari, ensuring that we made contact in correct tzubazeriai and used the power from our hips by dropping our weight down. We paid special attention not to push from the arms and shoulders. Moving on to men- hiki- men, we looked at how to create correct distance as we moved back, so that we hit the target with the datotsu bu of the shinai. We then tried men-hiki-gote and men-hiki-dou. With these the challenge was to ensure that motodachi gave the correct opening, so for hiki gote the idea is to push to his right in tzubazeri, so that he pushes back and exposes his kote as you step back and release the pressure. With dou you need to push down so that he pushes up and creates an opening. We finally added gyaku dou to the set and put them all together. Men-hiki-men, men-hiki-gote, men-hiki-dou, men-hiki-gyaku dou, followed by a shomen strike to finish and repeated the exercise for 30 minutes in mawari geiko. I have seen and taken part in this kind of drill on a number of occasions in Japan. In fact one teacher in Hyogo uses this as the backbone of his dojo’s training. When I first saw this my first reaction was to wonder why such emphasis was put on body contact. However, watching colleagues I know well do the exercise was enlightening. As in kakarigeiko, a degree of tiredness makes people relax and use correct technique. Butsukarigeiko also ensures that your posture is correct as it is impossible to make repeated taiatari and hiki waza if you are leaning forward or backward. So any thoughts that the teacher in Hyogo was being harsh for no particular reason have now been dispelled. 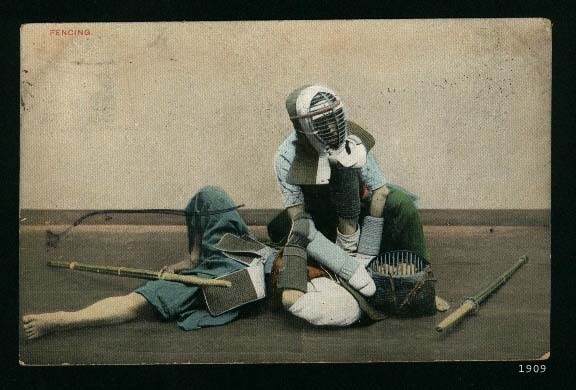 It’s very common for people to move to the side of their opponent in kendo. They either stand up from sonkyo and take a step to the right, or when they attack men or kote, they do so in a diagonal line, so that after striking they pass their opponent on the right. There is probably a biological reason for this. It might be because many of us feel that the right side of our body is stronger than the left, but that’s just speculation on my part. There are however some obvious kendo specific reasons why people move this way. Those in the habit of veering to the side after hitting, usually do so because they fear a collision with their opponent, injuring either themselves or the other player. What they fail to take into account is that the other party will more often than not, automatically move out of the way after being hit. If he doesn’t they can always use taiatari to finish the forward movement safely. When you stand from sonkyo, unless your opponent has a very weak kamae, it is unlikely that you will see an opening to attack. Many kendoka somewhat misguidedly think that by moving away from the centre they will have a side-on view of an exposed target. Unfortunately this does not happen as your opponent needs to turn only slightly to face you in your new position. One of the key things that we have to do to move up the grade ladder is to learn to face and dominate our opponent. When we rise from sonkyo we need to firstly take the time to feel and read our opponent’s mind, then to take the appropriate action to make a striking opportunity. This can be done by pushing forward and breaking your partner’s kamae, by moving his shinai out of the centre with either a harai, osae or makiotoshi technique, or by forcing him to move by showing an opening and beating him to the punch with a debana waza. This concept of drawing your opponent out is called hikidasu. This can be done in a number of ways. You can slightly raise the point of your shinai, or move your right foot forward, or just slightly bend your right knee. You can also use any of these in combination. Once he commits to an attack you respond with debana, or oji waza if his movement is more advanced. 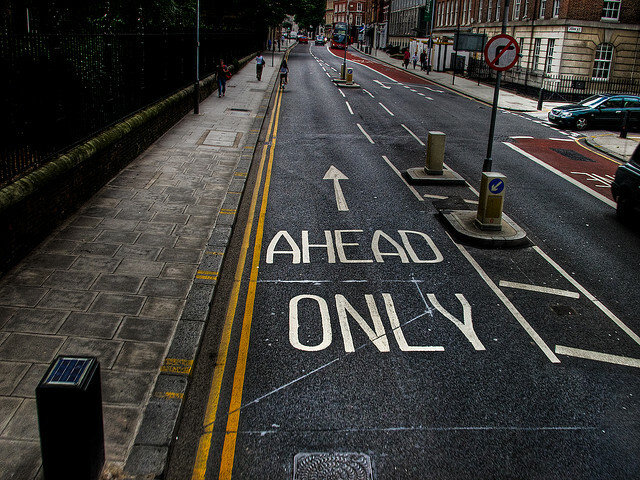 So don’t be tempted to step to the side. Hold the centre and demonstrate courage and confidence. Fast and accurate cutting in suburi. Keeping keiko short and intense. Including uchikomi-geiko, kakarigeiko and kirkaeshi in each and every keiko with motodachi. For me however the one point that really stood out was his view of the importance of kirikaeshi. He believes that by just practising kirikaeshi you could develop you kendo to a level where you could win major shiai. You start practising slowly and accurately ensuring that distance is correct. You do this by taking just one step forward from the starting position and strike shomen with one step, one cut. You make taiatari keeping your hands low and ensuring that motodachi provides suitable resistance. Neither of you should use your upper body power, but should push from the tanden. You then concentrate on striking yoko men accurately with correct hasuji. After the last yoko men strike you take only one step back (in tsugiashi) so that you are ready to make the next shomen attack in one step, one strike distance, pushing off from the left foot. Once you can do this correctly you add speed, concentrating initially on the speed of each strike, rather than the tempo of the whole exercise. Finally you start to work on correct breathing and kiai; breathing in deeply before the first strike, holding the air in your abdomen as you release part of it in kakegoe and then completing the whole kirikaeshi sequence in one breath with continuous kiai. Inoue sensei asserts that from training with kirikaeshi in this way you learn about correct posture and footwork, timing and opportunity, striking action and hasuji, correct breathing for kendo and the ability to easily and smoothly deliver continuous attack renzoku waza. If you include this with every keiko and also add uchikomi-geiko and kakarigeiko, it mirrors the training undertaken by the Japanese National Team under Inoue sensei and Kato sensei’s direction for the 14WKC in Sao Paulo. For us mere mortals, the intensity and duration of training should take our age and physical condition into account and depends on motodachi’s intuition. Sensei did however make the point that you should be able to train in this way well into your 50’s. Hopefully by the time we hit 60 we should be kicked across the dojo into a motodachi position.